In every culture there are certain events or celebrations or rituals (usually involving the spilling of blood) that you have to take part in if you want to truly experience what it means to be a part of that culture. Holiday celebrations are like that. An outing to the old ball park complete with hot dog is another. I don’t think you can really call yourself an American if you’ve never been to a baseball game. 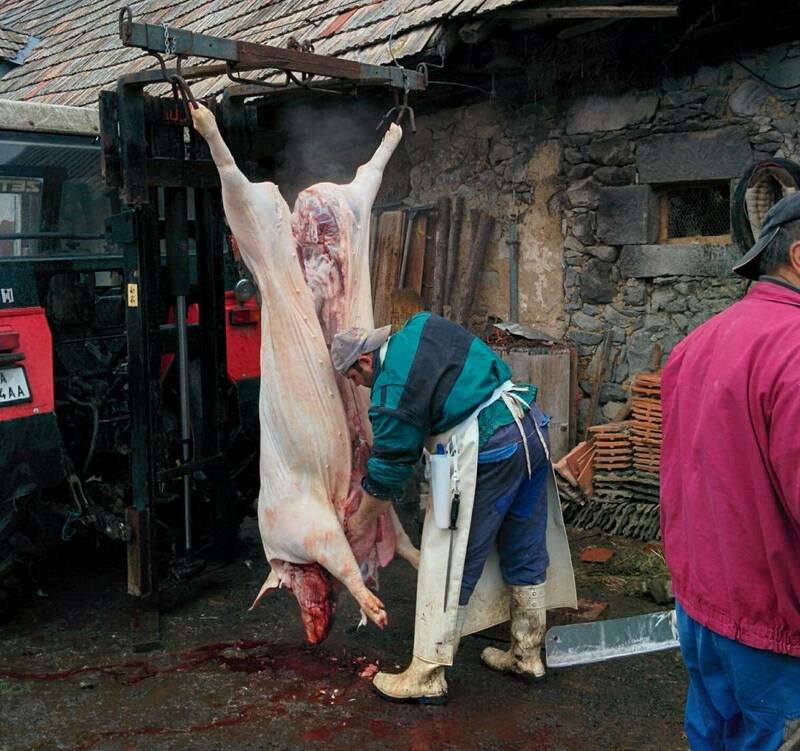 This past fall I got to take part in the quintessential Slovak right of passage ritual the zabíjačka, or, the butchering. It’s a feast, a family get together, and a right of passage all in one. Hey Would You Mind Driving on Friday? Our good friends invited us to take part in this year’s butchering. A few days before the big event the husband called me up and said, hey my car’s in the garage, can we take yours to pick up the meat? Since I have a mid-size family sedan, I put 2 and 2 together and thought, bummer, it’s not going to be a real zabíjačka, we’re just going to a butcher to pick up the meat and then we’ll cut it up and make bacon and sausages at home. *Sigh* I guess that will be fun too. We got to the town (Krupina) where we met the butcher and he guided us to the next stop in our journey. When we took a right and started heading for the hills I began to think I might need to reassess my assumptions. But I was absolutely sure when I backed up to the barn, got out of the car and heard the unmistakable snorting of live pigs. And then, when I looked at the 550 pound beast coming out of the barn and then looked over toward my car, I started eying my trunk like you do tupperware when you’re putting leftovers away. I also started thinking that our dog was really going to enjoy her next car ride. Like a cat in a meadow of catnip. The zabíjačka really is a family affair. 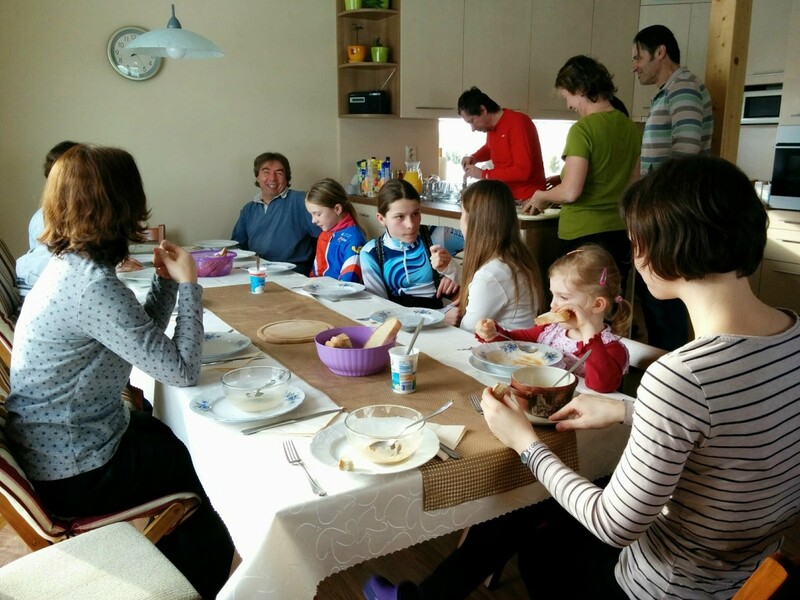 In fact, in Slovakia it’s usually just the immediate family that sits down together on Christmas Eve for the main holiday feast. It’s the same with Easter. But for the zabíjačka the whole extended family often comes together to take part in slicing, spicing, and smoking to make the delicious sausages, bacon, ham and black-pudding. And it’s usually in late fall to prepare the meat for the winter so the anticipation of the upcoming holidays plays a role in shaping the atmosphere of the day. And since it is an all day affair the event involves some feasting itself. We get to sample some of the first fruits with slices of fresh liver or a special zabíjačka stew. You can imagine it was quite a privilege to be invited to this event. For me it was the first time ever. For Jana it was a chance to recall an annual family event that we don’t have the chance to participate in anymore. Most importantly it was a great opportunity to bond with this family. A few years back, if you’ve been following us a while, you might remember that I helped Elisabeth and a friend make a video for a class project. Well, ever since then we’ve become very close with that family and the zabíjačka is one of our latest activities. Another great bonding experience we have with this and three other families is our small group. We started at the beginning of this school year with a cookout. Somehow that cookout started a tradition that has bonded our group. We don’t meet every week–just every couple of weeks or so, but when we do meet, it’s like a holiday. We get together on a Sunday at about 1:00. Somebody makes the main course, somebody makes the soup and everybody else brings some vegetables or a desert or beverage. After lunch and after some great conversation I’m in charge of leading a discussion. We have all different kinds in our group from people who are openly skeptical about Christianity, to people who might not be quite there yet, to long time believers and a blues guitarist. But we’re a close group and so it seems like every topic hits home for someone. We’ve talked about sources of wisdom and authority in our lives, why God allows evil, and worldview. I’ve never been involved in a small group like this. We’re a bunch of misfits that have bonded together. The discussions are open and honest and never dull. Think about us. Everybody is facing their own challenges. Please pray for wisdom to shepherd this group and pray especially for those that are searching. Brings to minds memories of butchering hogs with our friends the Pees here! A celebration of the goodness the Lord provides (though I think it violates at least 3 OT laws and has likely made me have to live outside the camp of Israel for the rest of my life). There is therefore now no condemnation!